If I were to choose one accomplishment I'm most proud of, it would have to be my debut victory. I was the underdog. I took on an opponent much more experienced than I was for my first fight. I beat her and retired her. I also gained my nickname and fan base after that victory. I've had 22 victories after that, but that one I'm most proud of. My sister Twee. She is resilient and hard working. She was in college tutoring calculus while learning English and graduated top of her class. I would bring one of my favorite books, probably one about mental strength. I would also bring underwear. Lastly, I would bring a hair tie, because my hair is a pain. Ben from Season 35. I am physically strong, assertive, but quiet and observant as well. 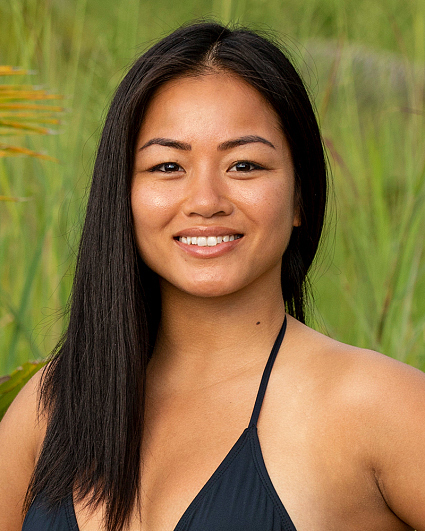 My first season I watched was Season 35, Heroes vs. Healers vs. Hustlers. I thought I could definitely dominate this experience and win. If I would've seen this show earlier, I would've applied years ago. I am an elite athlete. I would win many challenges and would be a great asset to the team. I was born and lived in rural Vietnam until I was 9 years old so my natural survival skills are impeccable. I've sold cars for a living and can convince people of what they want and need. Being a fighter, I'm a great strategist. Before a fight, besides the physical training, we watch and study film on our opponents to assess and strategize how to defeat them. Most of all, I am adaptable.